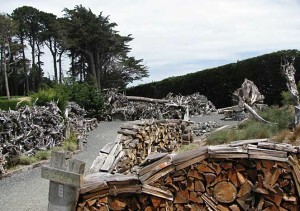 Invercargill artist Frank Wells has created this upside down world from stumps and logs damaged by storms, roots from peat bogs on the Awarua Plains (donated by several families), recycled railway sleepers and hardwood poles, and timber from reserves throughout Invercargill – all held together by steel rods and chains. Stumperies originated in 19th Century England as a way to transform storm-damaged areas. Ferns were encouraged to grow and the stumperies became very popular. The Queens Park stumps and logs are dense and slow to rot but become home to various insects and wildlife as they slowly decay. Ferns, lichens and mosses grow within the nooks and crannies of the stumpery.